Cornwall is famous for tin but though North Wales is often considered the UK capital of slate, Cornwall has had an equally pivotal role to play in supplying our country with the attractive, finely-laminated rock. It was a vital component of the industrial revolution because it was ideal for roofing (as it still is today) and myriad other uses include tombstones, tiling, flooring and electrical insulation. I’m ashamed to say I didn’t know any of that until I visited Carnglaze Caverns, near St Neot. 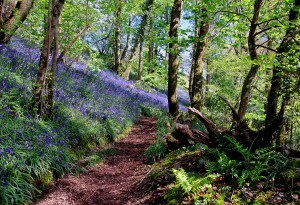 Hidden by glorious woodland and a couple of miles off the main A38 near Trago Mills, it’s rarely a place you stumble upon by accident but, as I discovered, is well worth seeking out. Carnglaze is the county’s only slate mine, with a fascinating history stretching back centuries. Slate is usually quarried and long before the nearby road was built, Loveny Valley, where Carnglaze is situated, was used for that purpose. 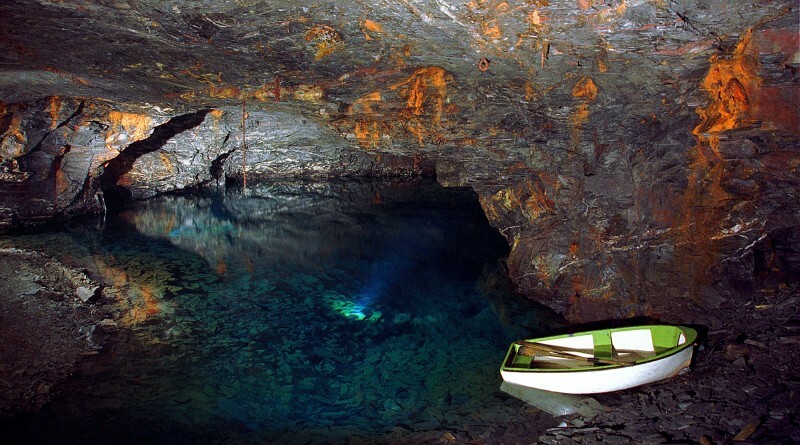 Deep mining on the site began in the 1700s to find better quality stone. Being underground meant the men could work in all weathers so they went in at river level and gradually went up – back-filling with their waste material in the process (like an early form of recycling). That meant they didn’t need ladders or scaffolding – an altogether safer way of mining slate than was the case in North Wales where a main cause of death was falling from great heights. Carnglaze no longer produces slate but it is a thriving visitor destination, wedding and concert venue. That’s all thanks to Caroline and Graham Richards who bought the place fifteen years ago when they moved down from Basingstoke with their family, ostensibly to retire. They’d seen an advert for the property in Country Life magazine and were attracted not just by the three-bedroom cottage within the grounds but also by the prospect of opening the caverns to the public and sharing their spectacular treasures. Caroline had been a geography teacher with a particular passion for geology so the combination was perfect – she would focus on managing and developing the business whilst Graham would continue to work as an architectural consultant and assist his wife as much as possible. Together with their team of helpers, the couple have transformed Carnglaze into four enchanting acres that allegedly boast fairies (children are invited to count them when they come), a lovely woodland walk (that’s covered in bluebells in spring and has signs pointing out features like rabbit and fox holes), glorious views (you can look down on St Neot far below) and an underground experience that will honestly leave you spellbound. No wonder between 20 and 30 weddings are held there every year. 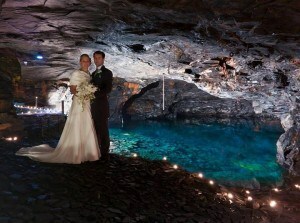 It may not be warm in the caves (the temperature remains 10 degrees all year round) and earth is never clean but the complete tranquility, extraordinary rock formations and deep sense of other-worldliness provide a uniquely memorable backdrop for exchanging vows in front of friends and family – even if it’s best to wear wellies rather than heels. My friend Kate and I chose to explore above ground first with Poppy, my Labrador, before donning our safety helmets and heading for the entrance to the first of three hand-created subterranean chambers, each as big as cathedrals. Tours are self-guided unless you book for a group – meaning you can often get the vast spaces to yourself. The first of those is the Rum Store (so-called because it was requisitioned by the Navy as a place of safe-keeping for the famously strong spirit) where a comprehensive collection of minerals from the South West can now be viewed. Further on is the concert hall where stars like Suzi Quatro and Rick Wakeman have performed – the acoustics must be as incredible as the surroundings and I’ve made a note to self to attend one of the mine’s regular stage events soon. A flight of 60 steps takes you down to the next level and the remaining two chambers, atmospherically lit to showcase the rock formations and with occasional waxwork figures to illustrate how the miners – some of them as young as fourteen (they were usually too arthritic to work beyond 35) – dug out the slate. There is a baby pool that creates the illusion of being far shallower than reality (it’s actually two metres deep and not the blue-green colour it appears) and, the piece de resistance in the Cathedral Chamber, a small lake that can be illuminated in different ways and on whose rocky outcrops weddings are often held. Five different species of bat live in the caves but unsurprisingly none were in evidence during our exploration. Visiting Carnglaze Caverns has been a complete revelation. A potent symbol of the past, it educates, enthralls and entertains - whilst at the same time, in a good way, mystifies. I loved it and can’t imagine why I’d never been before. Entry to Carnglaze Caverns costs £6 per adult and £4 per child aged 3-15.